Lysozyme belongs to the hydrolases (EC 3.-.-.-) enzymatic class. The hydrolases catalyze the hydrolysis or hydrolytic cleavage of a chemical bond by reaction: A – B + H2O → A – OH + B – H. This class of enzymes is usually classified by nature of the hydrolysed bond, then by chemical nature of the substrate, and finally by the enzyme. Despite systematic name for hydrolases always include hydrolase, the recommended name is formed by the name of the substrate with the suffix -ase. Within the class of hydrolases, Lysozyme belongs to the Glycosylases family (EC 3.2.-.-). Lysozyme reaction is the hydrolysis of the beta (1-4) glycosidic bond between N-acetylglucosamine sugar (NAG) and N-acetylmuramic acid sugar (NAM) and therefore it is possible classify it as Glycosidases, i.e. enzymes hydrolyzing O- and S-glycosyl (EC 3.2.1.-) with number 17 (EC 3.2.1.17) in this group. 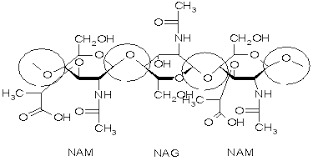 Lysozyme reaction is hydrolysis of the beta (1-4) glycosidic bond between N-acetylglucosamine sugar (NAG) and N-acetylmuramic acid sugar (NAM). These bonds are circled on the following figure. This reaction is take place in a long deep cleft, which contains the active site of Lysozyme (residues Glu35 and Asp52 for chicken egg white Lysozyme enzyme). This cleft is a very specific active site, which can bind only six sugar rings from a polysaccharide chain and hydrolyze them into a disaccharide and a tetrasaccharide subunit. The beta (1-4) glycosidic bond between N-acetylglucosamine sugar (NAG) and N-acetylmuramic acid sugar (NAM) to be hydrolysed during the Lysozyme reaction are circled. The modern revision of Lysozyme reaction mechanism was done by Strynadka: Strynadka, N.C.J. ; James, M.N.G. (1991) Lysozyme Revisited: Crystallographic Evidence for Distortion of an N-Acetylmuramic Acid Residue Bound in Site D. Journal of Molecular Biology, 220(2); 401-424. The mechanism of Lysozyme reaction during the hydrolysis of the beta (1-4) glycosidic bond between N-acetylglucosamine sugar (NAG) and N-acetylmuramic acid sugar (NAM).